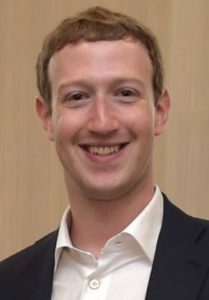 Mark Elliot Zuckerberg (b. 1984) was born in White Plains, New York to a Jewish family with German, Austrian, and Polish ancestry. He excelled in high school, won multiple awards, and by the time he was ready to go to college, knew Hebrew, French, Latin, and Greek. Zuckerberg was first taught programming by his father, and later had a private tutor, who called him a “prodigy”. In his youth, he created an instant messaging app for his father’s dentistry (a year before AOL’s Instant Messenger came out), as well as a music player that learned its user’s listening preferences. Not surprisingly, Zuckerberg went to Harvard to study computer science and psychology. He was a member of the Jewish fraternity AEPi. During this time, he made a number of programs, including one to coordinate with friends to choose the same classes, and another to rank people’s appearance (called Facemash) which was so popular it quickly crashed Harvard’s servers. In early 2004, Zuckerberg launched “Thefacebook”, and soon dropped out of school to work on it. After recruiting some friends, he moved his team to Silicon Valley. It wasn’t long before he had offers to buy out Facebook, which was now sweeping college campuses across the country. Zuckerberg refused, not wanting to have people’s information controlled by “media corporations owned by conglomerates”. The company went public in 2012, valued at a record-setting $104 billion. Today, Facebook boasts 2 billion active users, and nearly $30 billion in revenue. The company also owns Instagram, WhatsApp, and Oculus. Meanwhile, Zuckerberg has become a noted philanthropist. He donated over $100 million in 2010, before becoming America’s biggest charity donor in 2013 when, in a single act, he donated Facebook shares worth nearly $1 billion, making it the largest charitable gift ever. He has since pledged to donate 99% of his wealth. One of his main projects is to bring internet access to the billions of people that still do not have it. Zuckerberg has been ranked first in a list of the “Top 100 most influential people of the Information Age”. In recent years, he has taken a greater interest in both politics and religion. Last December, someone asked “Aren’t you an atheist?” to which he responded: “No. I was raised Jewish and then I went through a period where I questioned things, but now I believe religion is very important.” In May, he gave a commencement speech at Harvard (which finally awarded him an honourary degree years after he dropped out) and concluded with a traditional Hebrew Mi Sheberach blessing, stating that he always recited it when faced with challenges. Zuckerberg is still the CEO of Facebook, with a salary of $1. There have been rumours that he is planning to run for president in 2020. Just as wisdom is not something you can feel with your hands, Godliness is not something you can grasp with your mind. This entry was posted in Business & Finance, Science & Technology and tagged AEPi, American Jews, Chan Zuckerberg Initiative, Charity, Facebook, Facemash, Giving Pledge, Harvard, Hebrew, Instagram, Is Mark Zuckerberg Jewish, Oculus VR, Philanthropists, Thefacebook, WhatsApp on August 30, 2017 by Jew of the Week.